Train and Bus: Travel by train from Nong Khai to Thanaleng in Laos and take a bus or minivan from there to Vientiane. Tuk-Tuk, Bus and Minivan: Take a tuk-tuk to the border, a bus over the Thai-Laos Friendship Bridge, and then a bus or minivan from there to Vientiane. The best option is the first one (train and bus) because you avoid the long and chaotic queues to pass through immigration on the Laos side of the bridge. To make life even easier you also have the option of pre-booking your train ticket and connecting bus service to Vientiane online. It is more expensive to pre-booked than to turn up and arrange your transport to Vientiane on the day, but the advantage of taking a pre-booked tour is that you get to avoid the scam artists for which this border crossing is famous. There is very little difference between 2nd and 3rd class on this train, both are fan cooled, except of course for the extra 10 THB it costs you to travel 2nd class. Tickets can be purchased on the day of travel at the ticket counters inside Nong Khai train station. When you go to the ticket office the clerk will try to sell you a ‘joint ticket’ for 300 THB or more for combined train and minivan ticket. Buying a joint ticket is not compulsory and whatever you are told you can opt to buy the train ticket on its own without the minivan ticket as an add on. Leaving Thailand: Go to the immigration booth on platform 1 at Nong Khai Train station after you have collected your train ticket to Thanaleng. Hand your passport and completed departure card to the immigration official in the ticket booth for an exit stamp out of Thailand. Entering Laos: After leaving the train at Thanaleng go to the immigration booth at the train station. At window #1 collect an arrival/departure card and a visa application form for Laos. Complete the application form, the arrival card, and hand them back to the officer at window #1 with a passport photograph and $35 USD or 1,500 THB. Then wait near window #2 for the officer at that window to hold up your passport for collection. As you depart the train station towards the car park there is sign by a desk advertising transfers to Vientiane for 100 THB or 25,000 Kip. You can simply choose to buy your ticket to travel onto Vientiane from Thanaleng at the train station. Travel Tip: There are lots of people who have reported that they have experienced problems with both the minivan booked at Nong Khai train station and the minivan they arranged at Thanaleng. The issue is that the driver demands more money than initially agreed when you reach your destination in Vientiane. This is a very common problem. Rather than taking a chance on experiencing problems with minivan transfers from the border to Vientiane you have the option of pre-booking your travel from Nong Khai with Thai company Naga Travel which runs tours in Thailand, Laos, Cambodia, Vietnam and Myanmar. This service costs more than doing the trip independently and whether the extra cost represents value for money depends upon how you feel about dealing with scam artists. Ticket Collection: Present your E-Voucher at the ticket counter at Nong Khai train station. Journey details: 07:30 train from Nong Khai to Thanaleng and then transfer by micro-bus to Vientiane city centre. Border Opening Times: You need to cross between the hours of 06:00 and 22:00. Travel from Nong Khai train station to the bridge: Exit the train station and take a tuk-tuk to the Thai Immigation office. Simply the tell the tuk-tuk driver you want to go to Laos and he will take you to the immigration office. Expect to pay 60 to 80 THB. Warning: Some tuk-tuk drivers at Nong Khai will try to insist that they take you to a special office where they can quickly issue you with a visa for Laos. This is a scam. Get your visa at the Laos border. Thai Immigration: Hand your passport and completed departure card to Thai Immigration and get your stamp out of Thailand. Shuttle Bus Across the Bridge: You can walk over the bridge but most people choose to take the shuttle bus which costs 20 THB. There is a ticket counter as soon as you pass through Thai immigration. Laos Immigration: After you leave the shuttle bus go to the office with the the sign stating ‘Visa on Arrival’. A 30 day visa costs $35 USD or 1,500 THB. You need to complete the visa application form and provide a passport photograph. They also charge a fee for a ‘border pass’ which is $1 USD or 40 THB. 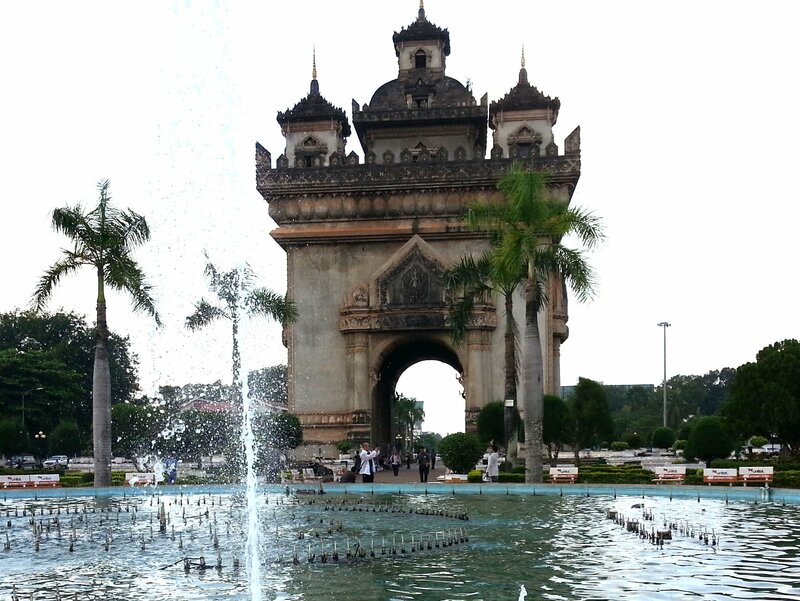 Travel to Vientiane: Once you have obtained your visa there are a variety of different transport options available. The cheapest is the green air-conditioned bus which will take you to Vientiane bus station for 6,000 kip or 20 THB. Vientiane bus station is some distance from the twon centre and you will need to take taxi from the bus station. A more expensive option is for a seat on a minivan which will cost you around 300 THB and take you direct to the Thai Embassy in Vientiane.